As a member of a small farm share this year, I received more apples than I could eat raw. I have juiced them and made applesauce, but I still have plenty on hand. So when I recently decided to make a Dutch baby, a wonderful pancake variation I had eaten but not yet made myself, my extra apples were an obvious addition. I believe that New Yorkers should eat only apples grown locally. Our state is a leading apple producer—second only to Washington—and boasts a tremendous variety and quality of them. While Red Delicious and Granny Smith seem to dominate the marketplace due to their long shelf life, many of us have more nuanced apple preferences. I like Winesap, the tart Cortland, and the cute Macintosh, myself. But any apple works well in this Dutch baby recipe. These pancakes are like a cross between a crepe, a pudding, and a popover and are actually of German origin—the moniker is a corruption of Deutsch. The dish was publicly introduced Stateside at the historic Manca’s Cafe in Seattle in the early 1900s. It’s surprising that it never became more popular here since it’s delicious and easy to make using readily available kitchen staples—eggs, butter, milk, flour, and sugar. It’s also easy to adapt using alternatives that many people like these days, so alongside each standard ingredient I have listed substitutions that you can play around with. Your brunch guests—or children or roommates—are sure to be impressed with this yummy, no-hassle comfort food. Optional toppings: Confectioner's sugar and a squeeze of lemon is most traditional, but feel free to try maple syrup, caramel sauce, jam, or honey. Melt butter in a 10- to 12-inch skillet (preferably a well-seasoned, cast-iron one, but any heavy ovenproof skillet is fine). Make sure the butter coats the entire pan, both bottom and sides. Add the sliced apples and cook until they soften and begin to caramelize. The finished pancake should slide easily out of the pan, but if not, use a spatula to transfer it to a plate, or just server it directly from the pan. Dust with powdered sugar, a squeeze of lemon, or a drizzle of syrup or other toppings and serve immediately. This came out great! So good, you better double the recipe because you will want more. Thanks! Looks yummy, probably sinfully delish. 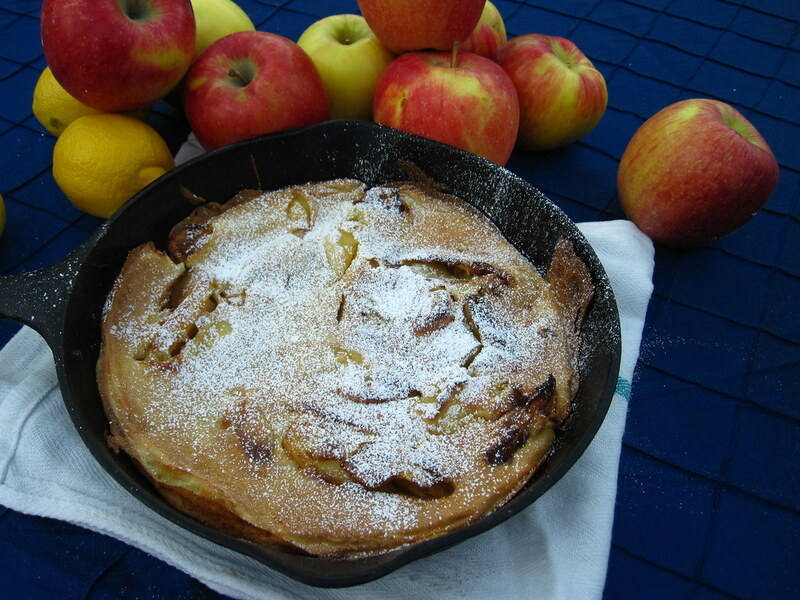 Locally harvested apples make a wonderful addition to this German pancake variation. Photo by Ariel Nadelberg.